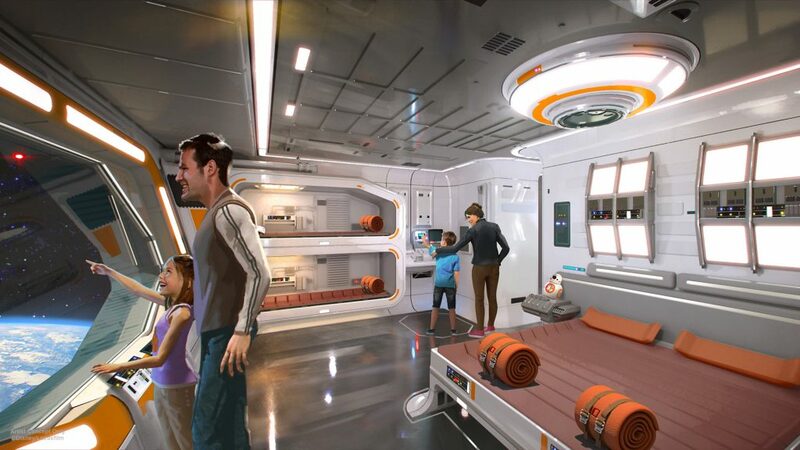 Announced back at D23 in July of 2017, the new Star Wars hotel promises a “100% immersive” story that will “touch every single minute of your stay”. 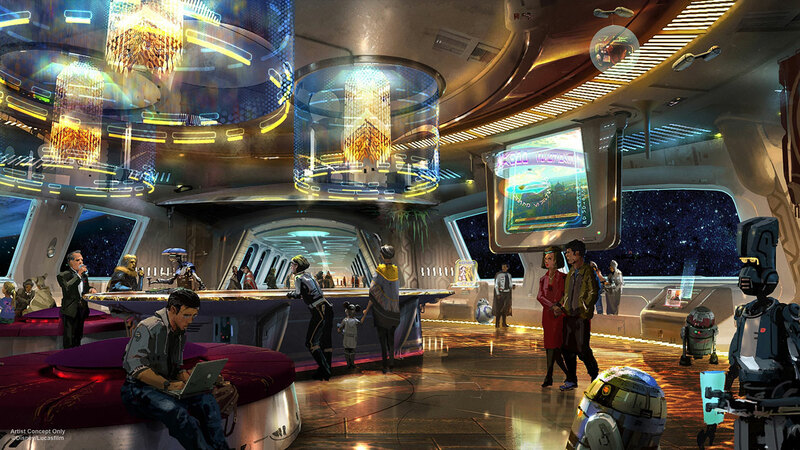 Guests will be transported to a star ship and become active citizens of the Star Wars galaxy for a multi-day adventure that will be seamlessly linked to Star Wars: Galaxy’s Edge at Disney’s Hollywood Studios. The hotel is certainly an ambitions undertaking, and since there haven’t been many more details announced, the Internet has been buzzing with speculation about how certain aspects of the hotel will work. 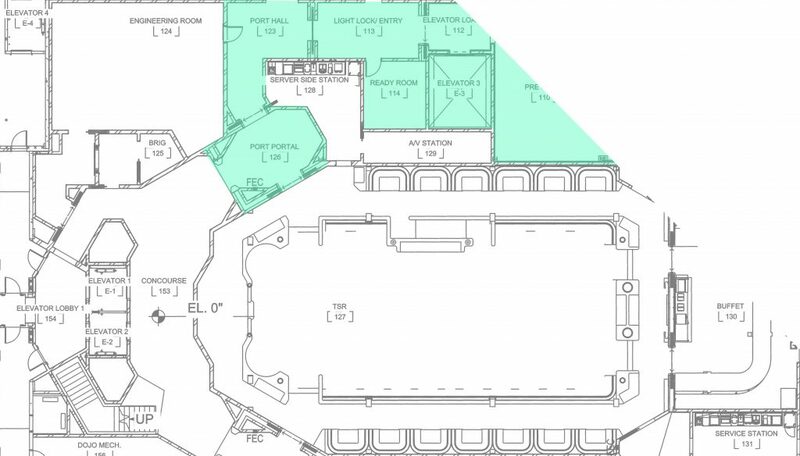 Back in July, a permit filed with the South Florida Water Management District gave us some basic info about the hotel’s general size, the fact that it will only be two stories tall, and its position in relation to Hollywood Studios. Now, a new permit filed on November 9th for the wastewater/sewer system sheds some more light on the project with some detailed drawings of the hotel’s first floor. Before we dive into the in-depth look, here’s a handy color-coded overview so you can get a general idea of its layout. We’ll start off by taking a look at the arrival area, which appears to be under a very large, futuristic looking porte-cochère. Since the hotel lacks an immediately adjacent parking lot, your car will likely be valeted upon arrival. Once you enter the hotel, it looks like the first order of business will be security. Your luggage will be sent through some luggage x-ray machines, and then you’ll pass through some metal detectors. 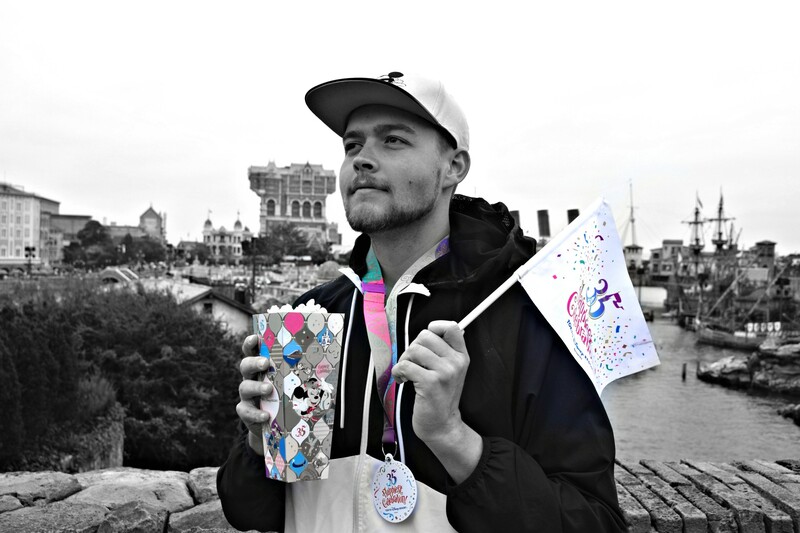 Since your whole experience is supposed to be seamless going from hotel to park, getting all the security procedures out of the way first is definitely smart. Plus, if the exterior/entrance area of the hotel is an Earth-based space port, it makes thematic sense to have to go through a security checkpoint before embarking on your flight into space. After passing through security you’ll head down a long hallway and into a room labeled “Pre-” something. Unfortunately, the rest of the word is cut off on these particular plan sheets, but it’s not a stretch to assume this room is called “Pre-show” or “Pre-load” based on the subsequent room names. You’ll then enter the “Elevator Load” room and board what’s labeled as an actual “elevator”. Since we only have the plan sheet for the first floor, it’s impossible to say if this elevator will bring guests staying on the second floor up to an identical set of post-elevator arrival rooms, or if it’ll be like the Hydrolators from The Living Seas and let everyone back out on the same floor. Either way, Disney released this bit of animated concept art back in February, giving us a peek at what they intend the elevator experience to look like as you leave Earth and head to the ship. Assuming everyone will exit the elevator on the same floor, you’ll then pass through several more themed rooms until you end up in the main concourse of the ship, which has several interesting sounding locations and (some of?) the hotel’s dining options. 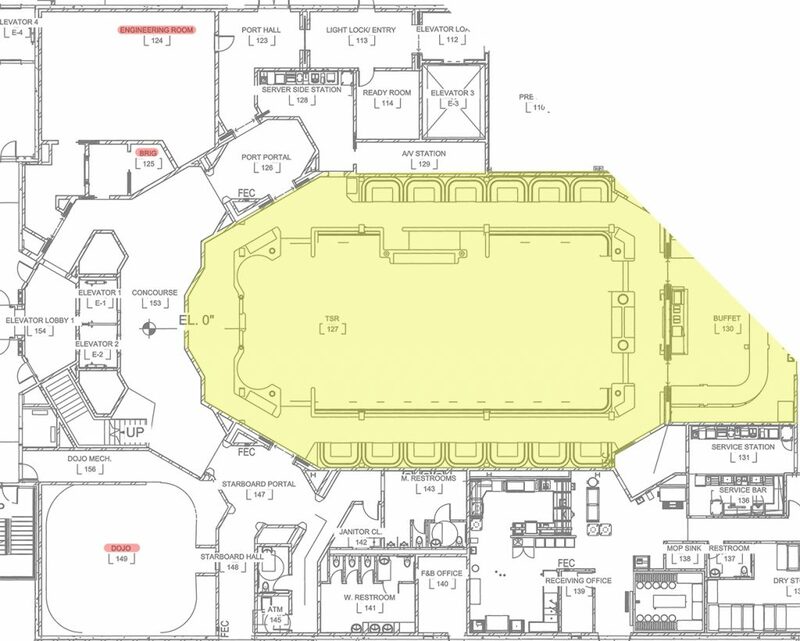 Highlighted below in yellow is a table service restaurant (TSR) and a buffet. It’ll be interesting to see if there’s some kind of buffet or dining option on the second level as well, or if everyone will have to come down to the first level to eat. 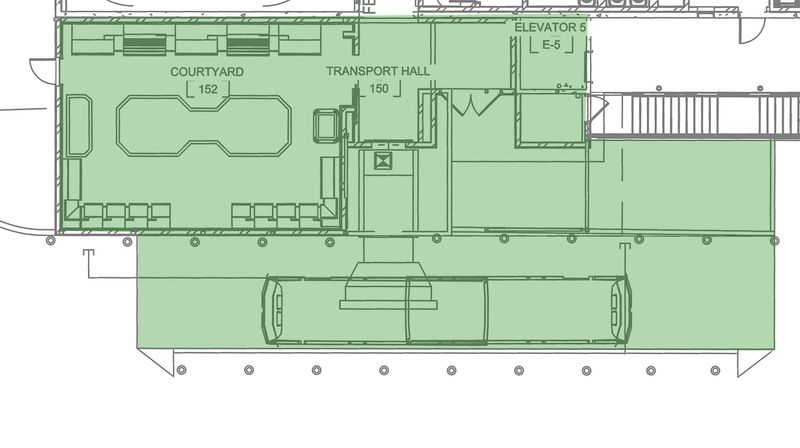 Other interesting rooms on the above section of plans include the Dojo, the Brig, and the Engineering Room. The Dojo has a mechanical room adjacent to it, so I’d expect there to be some kind of show elements involved there, possibly something similar to the Jedi Training Academy at Hollywood Studios. The Brig and Engineering Room might also be interesting little experiences, so let the speculation run wild! Heading towards the back of the hotel now, we get a peek at the guest rooms, appropriately called cabins. It looks like they’ll have two sizes, a regular sized cabin and the larger 1st Class cabin. 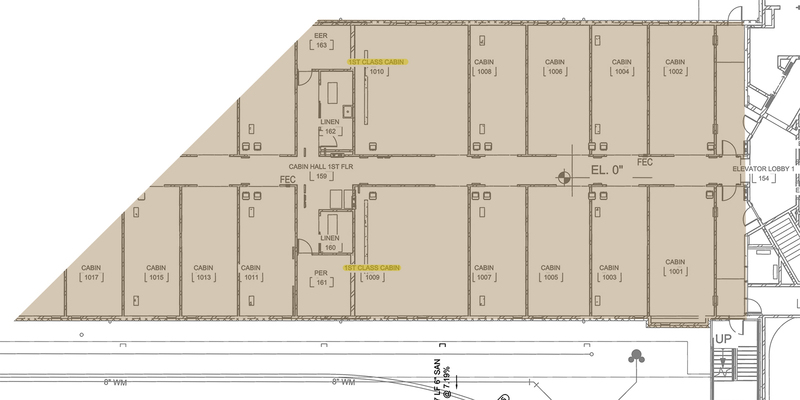 The first floor has 32 regular cabins and two 1st Class cabins, so if the second floor has an identical layout, this hotel could have as few as 68 rooms! Below you’ll also find some concept art released by Disney of what the ship’s cabins might look like. The final interesting tidbit from these plans is the “Transport Hall” located on the southwestern side of the hotel. It appears the primary form of transport between the hotel and Star Wars: Galaxy’s Edge will be via buses, which should come as no surprise. 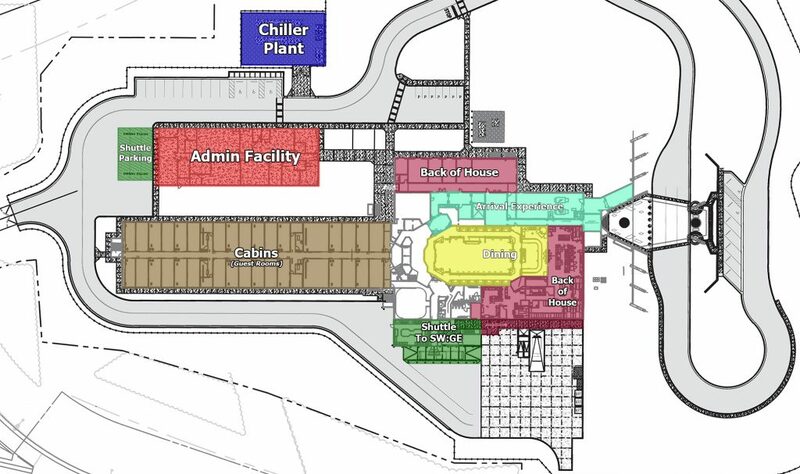 Based on the plans below, it looks guests will walk through a sort of jet bridge/gangway onto custom designed shuttle buses to be transported into the park. Thanks for checking out our story on this new Star Wars Hotel permit! I hope you enjoyed my analysis, and feel free to comment below with anything I may have missed or gotten incorrect! I know this was a bit different than our usual type of coverage, so if you want to see more like this, let us know! While you’re here, be sure to check out our other recent Florida articles, and follow us on Instagram and Facebook for more updates and photos! Awesome find! Thank you for color-coding and labeling everything too, makes it easy to understand. I wonder if more WDW hotels will start using baggage X-Rays, and this will only be the first, or, if it’s just because of its proximity to the theme park (like they do at some of the overseas Disney park hotels). Thanks again! Only 68 rooms! They will either have to do reservations through some form of lottery system or the wait time will be 5-10 years to go. Ugh. On a side note regarding the “elevator” at the entry area, remember that the Hydrolators were “technically” elevators (Otis permits & everything) so it may be a similar effect and they have to label them as elevators on the plans for that reason.